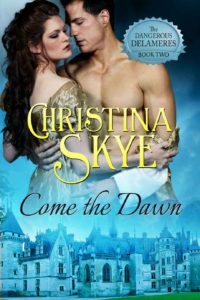 India, the beautiful and headstrong sister of Come the Night’s hero, Luc Delamere, falls in love with the rakish Devlyn Carlisle during the chaos and uncertainty of war. Though their time together is short, they find a passion neither can forget. But Devlyn is cut down by a French saber at Waterloo, and India’s joy is torn away. Back in England India struggles to accept her life alone, without the only man she will ever love. But now he is back – with the cold eyes of a stranger. All they shared is forgotten. India will not rest until she discovers who has betrayed Dev, and it will be a job more dangerous than she can imagine. As they work together, each fighting newly stirred desires, India vows to make the lost earl remember all they once shared, no matter how dangerous to her reputation – and her heart.